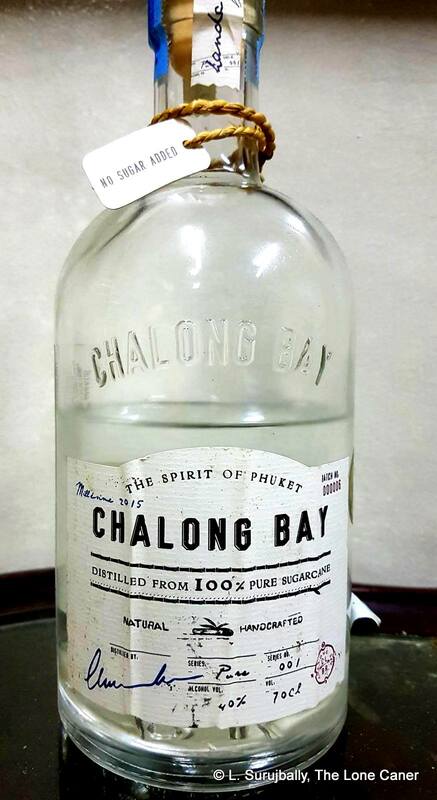 Thailand doesn’t loom very large in the eyes of the mostly west-facing rum writers’ brigade, but just because they make it for the Asian palate and not the Euro-American cask-loving rum chums, doesn’t mean what they make can be ignored; similar in some respects to the light rums from Puerto Rico, Dominican Republic, Panama and Latin America, they may not be rums du jour, yet they continue to produce for their own local audiences and sell very nicely worldwide, thank you very much. There’s a market for the profile, and given the enormous population of Asia, it’s no surprise that they can make rums for themselves, and sell them, without always worrying too much about the hot topics of purity, additives, ageing and terroire that are so much discussed elsewhere. That’s not to say that Issan, the company that makes this low-key white rum, doesn’t adhere to such principles. They certainly do. Located just a short distance from the Laotian border in the north east of Thailand, a stone’s throw from the town of Vientiane (which makes its own rum), Issan uses handcut, hand-peeled cane (grown without herbicides or pesticides, sourced from its own farm and from small farmers around the area), its own strain of yeast, and a small copper pot still imported from Europe. Like the French Caribbean islands, cane is cut and pressed to cane juice and set to ferment within 48 hours (for 3-4 days), and the waste cane is used as both fuel and fertilizer in an effort to be both ecologically sound and environmentally sustainable. The operation is somewhat more primitive than Chalong Bay (for example), but one can’t argue with the philosophy of artisanal production espoused by founder David Giallorenzo, a Frenchman from Abruzzo, who relocated to Thailand to start Issan in 2011 after a career in the financial services industry. With export licenses taking a year to put together, the still arriving in December 2013, the next year started with just under a thousand bottles of production, and then initial exports were limited to a thousand bottles to France, Italy, Switzerland, Andorra and Belgium. This was not large, but the company got a boost in 2014 when it won a silver medal in Hong Kong International Wine & Spirit Competition (again in 2016), as well as bronze and gold medals in the Paris Rhumfest in 2015. By 2018, the target was ten thousand bottles of production, new stills had been ordered (for greater capacity) and with continued market increase in Europe and exposure by online magazines and bloggers, its rumprint is sure to escalate in the years to come. Aged rums (or rhums, if you like) are not a major part of the program at this stage (though they do age their rums for a minimum of six months which suggests some level of filtration), and the one I tried was their 40% white, about which I’d heard quite a bit over the years but never got a chance to try — John Go sent it to me, knowing of my fondness for juice from Asia. And for a product that was more or less still in swaddling clothes compared to its agricole competition in the Caribbean, it wasn’t half bad. The nose was very very briny, accompanied with what seemed like an entire basket of olives, and alongside that was the dry mustiness of dried rice paddy and sacking (similar to the TECC and Cambridge Jamaicans, remember those? ), yoghurt, and sweet flavours – swank, mangoes, green peas fresh out of the can, very delicate fruits which had to do major lifting to get themselves past the wall of salt. There was also some faint acidic notes which balanced things off, light citrus (tangerine, let’s say) and also cereals, biscuits and oatmeal cookies and some buttermilk, all of which got slightly sweeter after everything opens up. In other words, it took the aromas of any good agricole, and then went their own unique way with it. The nose was pretty good — the palate was where it was somewhat weaker. This was, I suppose, to be expected — standard proof rums have to be remarkably intense to get one’s attention these days and that goes as much for whites as any other. So – it was watery and quite light, in no way aggressive, warm and sweet, and actually quite pleasant. You could mix it, but why bother? It had the light sugar water, light lemon zest, light pears and white guavas, and light spices….cumin, a suggestion of nutmeg, little else aside from a pinch of salt. There’s a finish of sorts, short, sweet, watery and slightly fruity, and about all that could reasonably be expected. Still, given that I walked in expecting even less, it was a really enjoyable product, akin to a softer clairin. My personal experience with Asian spirits suggests they tend to be less in-your-face, smoother, a shade sweeter – sometimes additives perform the function of making it palatable. As far as I know, Issan issues what comes of the still into the bottle without any messing around except to reduce it to 40% and some filtration, and they do a pretty good job here…I can only imagine what a more potent full proof version would be like (probably knock my socks off, I’m thinking, and if they could get it past Thai legislation which forbids bottling spirits north of 40%, and out to the West, more medals would be in the offing for sure). The Issan isn’t out to change the rumiverse, doesn’t want to reinvent the pantheon of rums (white or otherwise), and is a left-of-straightforward, relatively light, eager-to-please white rum — and deceptive in that you only think it’s weak when you start…then it grows little fangs and shows some aggro, and you realize there’s rather more here than was immediately apparent. It’s a neat drink, well made, a slow-burn white, perhaps made for those who walk in believing they’re getting a gentle sundowner…and are then suckered into enjoying something just a shade more potent.